Strategies involving the creation of a large revenue loss are often sold as a method of providing significant tax savings to the next generation. However, they do not always factor in the interaction of ECPI. The interaction between exempt current pension income (ECPI) and carried forward tax losses is not necessarily simple for funds with members in pension phase. The ATO is examining whether SMSFs are appropriately carrying forward tax losses, correctly apportioning expenses and factoring in net ECPI when they are partly in pension phase. The minutes of the Losses and CGT Subcommittee meeting in November 2012 highlights that this area has been a focus of compliance activities. In response, the ATO published a fact sheet titled Self-managed super funds and tax exemptions on pension assets. There are planning strategies that involve creating large revenue losses in one year. For example, losses created by anti-detriment payments and utilising the future service liability claim option for insurance, which are carried forward and used to offset the fund’s assessable income in subsequent years. 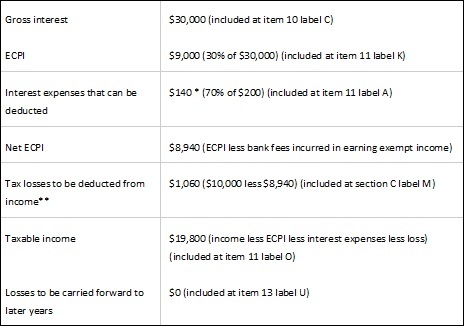 Often these strategies do not take into account the reduced tax effectiveness of a brought forward tax loss if the fund derives sufficient ECPI to reduce the loss. To quantify the actual tax benefit of the strategy, advisers must be careful to look beyond the year in which the payment is made. The recent decision in Payne Superannuation Fund v Commissioner of Taxation  AATA 58 (Payne’s Case) confirms the correct application of the relevant tax loss sections and simply states a net exempt loss cannot be carried forward to reduce the amount of net exempt income in a future year. Can an SMSF carry forward a tax loss? An SMSF is a form of a trust and would normally have to satisfy the applicable tests in Schedule 2F of ITAA 1936 to carry forward a revenue loss. A complying superannuation fund in s45 of SISA, however, will be classified as an ‘excepted trust’ in s272-100(b) and will not be subject to the trust loss measures. The Administrative Appeals Tribunal sought to determine in Payne’s Case whether a net exempt loss (excess of allowable deductions relating to exempt income over the exempt income) could be carried forward to the next financial year. The advantage of this was a reduction in the net exempt income of the following year, which would in turn reduce the amount of tax loss that would be applied in that financial year. The taxpayer had a carried forward tax loss and also carried forward a net exempt loss. The ATO denied the application of a net exempt loss from a prior year and amended the tax assessments for the 2009, 2010 and 2011 financial years. The fund amendments adjusted the apportionment of the expenses claimed between the exempt income and assessable income of the fund in each of the relevant tax years. This had the effect of reducing the carried forward revenue loss originally calculated in the 2009 year, which carried forward to the calculation of taxable income in the 2010 and 2011 financial years. The tribunal noted that under s36-10, a tax loss arises in any income year in which the taxpayer’s allowable deductions exceed the taxpayer’s assessable income, provided that excess also exceeds any net exempt income for the income year. s36-20(1) specifically applies to SMSFs and details losses and outgoings incurred in deriving that exempt income and allowing for a deduction to the extent that it is incurred in deriving that exempt income in that year of income. The tribunal reaffirmed the ATO stance that there is no provision in the tax law that provides that where losses and outgoings in relation to exempt income exceed exempt income the excess can be applied to reduce net exempt income in future years. The outcome of the case is simply that net exempt losses are not carried forward. Net exempt losses have no impact on a later year’s taxable income. The losses used in this example refer to tax losses as opposed to capital losses. *The remaining bank fees of $60 (30 per cent of $200) cannot be claimed as a deduction because they were incurred in earning the exempt current pension income. ** Tax losses carried forward must be reduced by net ECPI before they can be offset against assessable income. To summarise, the ATO will scrutinise funds with ECPI to ensure that tax losses carried forward are not over-claimed. Advisers must also be aware that the value of a tax loss may be significantly eroded by funds deriving sufficient net exempt income, which will reduce the loss and look to future years to assess their benefit.